Many of us give up at the first sign of failure. We let our lack of success define and shape us. What if it didn’t have to be this way? What if we could continue on despite our doubts? That’s why Chalky developed his what if factor questions. These questions help him decide whether or not he should pursue his goals, despite his doubts. The benefit of constantly asking yourself positive what if questions is that they make you want to continue on. They help to push you forward instead of falling back or giving up. Chalky believes these what if questions helped him publish his book. They helped him get past his biggest naysayer, himself. They have helped guide him through many things in life. 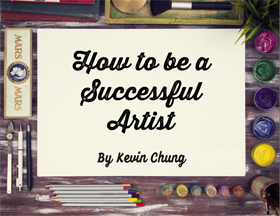 There are many things that help you sustain a long career as an artist. Talent and luck help a lot, but one thing is often overlooked. It’s something we can all control. That thing is persistence. Most of us give up after the first sign of failure. We give up when things are looking grim. We give up when things don’t go our way. We give up when someone says no. But we can’t let those setbacks stop us dead in our tracks. We must go on despite our doubts. Chalky doesn’t believe no means no forever. He follows up with people until he gets a yes. We need to constantly push ourselves, especially when we are down. It’s easy to lose morale when things aren’t going your way, but if you really want to achieve your goals, you have to be persistent. Sometimes we just need that extra push to keep us going. That’s why Chalky constantly asks himself what if. If you don’t like the answer to those what if questions, you have no choice but to keep going. If you want something bad enough, you will put all your effort into it. You will do everything you can to succeed. That’s often the thing that separates people who eventually succeed and those who don’t. Some people just can’t handle the constant grind, the constant rejections, the constant failure. Failure never stopped Chalky from achieving his dreams. He kept attempting his exams even after multiple failures. He became an instructor despite the doubters. He wrote a book even though people told him he shouldn’t. There’s something inside him that told him to keep going. When you want something bad enough, you will go on no matter what happens. Chalky uses his system of what if questions to help him stay persistent. I know it’s scary to put yourself out there. Rejections and failures get to everyone, but think of the alternative. Think of all those people who had great things to share with the world, but were too scared to overcome their fears. Do you want to let your great ideas go to the grave with you? keep asking yourself What Ifs?